In April of 2015 after hearing news of the mega earthquake in Nepal, Akash and Harmony Pandey wanted very much to do something to help the people in their father’s homeland. Harmony’s 6th birthday party was coming up and she decided to ask her friends to bring donations for earthquake victims instead of presents for the party. Soon after, Akash, who was 9 at the time, decided that he wanted to try to make T-shirts to sell in order to raise money. Akash worked to design a shirt and soon they were sent to the printers. The children sent some of the money they raised in the campaign they were now calling ByKids4Kids to a family friend who was in Nepal at the time of the quake and was delivering immediate aid to victims. A member of his team was filming as Bash gave supplies to the children and told them that Akash and Harmony from America sent the supplies so that they can keep studying. One of the children replied that they cannot study because their school has been destroyed. After seeing the video, Akash and Harmony decided that they wanted to help rebuild a school in Nepal. Akash and Harmony sent the rest of the money they raised to the Gorkha Foundation to help build the Shree Mahendra Jyoti Primary School in Kerabari. Soon they decided that they wanted to go to Nepal and visit the school. In the summer of 2016, Akash and Harmony went to Nepal with their mother and father to visit family and to see the school in Gorkha. It was a long journey. They left for Gorkha on a bus leaving at early in the morning, later they switched to a jeep and spent 4 hours on a super rugged road. Then they had a 4-hour hike straight downhill to Bhir Singh village. The name means steep horn, and the road is very steep, even by Nepali standards. However, they were so happy to arrive, greeted by the whole village. Soon all of the children were singing and dancing together. That night they stayed in one of the temporary shelters made of bamboo and tin that had been built since the quake. Even more than a year later, none of the homes in the village were habitable or rebuilt. Akash and Harmony felt lucky that the shelter was only a little leaky, but could imagine how difficult it would be to live in for a long time during the rainy season especially. In the morning they hiked up to the new school situated in the beautiful, rugged mountains. The beautiful people who live there went all out to thank Akash and Harmony for raising money to help rebuild the school. 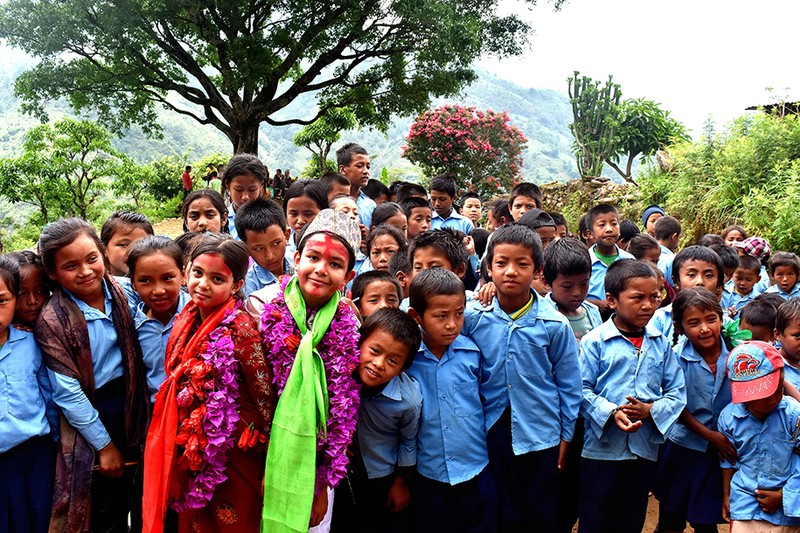 The villagers dressed Akash and Harmony in local Gurung clothes. Akash and Harmony gave the school and the students the books and other school supplies they had collected with the help of their own school, Aspen Elementary School. After taking a tour of the school and sitting in some of the classrooms, it was time to say goodbye. Several of the boys put their arms around Akash and each other and starting walking up the path to the road. Two girls took Harmony by the hands and led her up the path whispering and giggling as if they were old friends. It was even harder to say goodbye than it was to hike back up the steep path to the road. Akash and Harmony are not finished raising money and want to keep helping Nepal all they can. Since they have been back they have been interviewed by the local newspaper and spoken at meetings of non-profit organizations like the Rotary Club. One of Akash’s former teachers has been inspired to talk to her current class about the situation in Gorkha and how even one child can make a big difference in the world and will also be doing fundraising for the Gorkha Foundation in her class.